Canadian-Dutch cellist, Carmen Bruno is currently pursuing a Doctor of Music in Cello Performance at McGill University’s Schulich School of Music with professor Matt Haimovitz, where she recently earned her Master’s degree. She received her Bachelor of Music from the Conservatorium van Amsterdam with professors Jeroen den Herder, Maarten Mostert, and Dmitri Ferschtman. 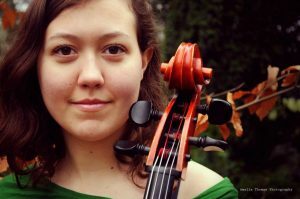 She was a member of the YOA Orchestra of the Americas in 2014, and in 2015 she was invited to play as a soloist with NYO Canada on their nationwide tour. Carmen is an active chamber musician, having performed in notable festivals across Europe and North America with various ensembles. She is a member of the 2018 Global Leaders Program cohort and traveled recently traveled to Panama and Chile to perform and teach. Carmen plays a French cello, c. 1880 made by Theophile Pierre, and generously loaned to her by the Carlsen Cello Foundation.